I kinda made this recipe up but its based on the usual enchilada recipe. Hubby loved it so much that he couldn’t even blow on it before eating it…he said and I quote “its burning my mouth but I want it! Its so good!” Instead of using the cheddar cheese soup,you can make a béchamel sauce(a basic cream sauce) and add a mexican 4 cheese blend packet to it once it’s done, essentially making homemade cheddar soup. Preheat oven to 375 degrees and take out a 9×13 pan. Combine ground beef, drained tomatoes, 2 tablespoons of chili powder, 1 tablespoon cumin, hot sauce, and pepper in a bowl and mix until well blended. Place the mixture in the tortillas rolling them up like burritos once done. If you place them side by side, like they are making the shape of a square, it will be easier to divvy up the mixture. Open the can of tomato soup, spoon some of the soup into the 9×13 pan and spread it out. This will keep the tortillas from sticking. Place the tortillas into the pan, seam-side down. Pour the rest of the tomato soup into the bowl that you used for the beef mixture, and add the rest of the spices (chili powder, cinnamon and cumin). Mix together. Pour the tomato soup mixture over the tortillas. Open the cheddar soup and pour into the bowl used for the tomato soup mixture and beef mixture, and add half a can of water. Mix well. Pour on top of the tortillas. Top it all off with the shredded cheese. 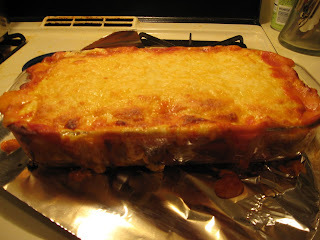 Bake for about 30 minutes or until bubbling and cheese is gooey and yummy and oozing…. (i’m drooling right now). Let cool for about 15 to 30 minutes. Enjoy with a nice side salad. Ole! Tip: This recipe works just as well with some leftover pot roast or even roasted chicken. Looking for a vegetarian version? Use black beans in the place of the ground beef. Crockpot instructions: This is so easy to make in the slow cooker! Just follow the same exact directions but put the enchiladas in the slow cooker sleeve instead of the baking dish. If you use smaller tortillas, you can get in more of them. Turn on slow cooker and cook on low for 6 to 8 hours or high for 4 to 5 hours. This is a great “set it and forget it” recipe. If you like a crusty cheese on top, vent the slow cooker during the last hour of cooking by placing a chopstick or wooden spoon in between the lid and the slow cooker.